Russian Deputy Foreign Minister Mikhail Bogdanov concluded his visit to Lebanon on Sunday after meeting with Hezbollah leader Hassan Nasrallah at an undisclosed location as part of his four-day trip to the region, which focused on finding a peaceful solution to the Syrian civil war. Bogdanov, who arrived arrived in Beirut on Thursday met with several Lebanese leaders, including Foreign Minister Gebran Bassil, Prime Minister Tammam Salam, parliament speaker Nabih Berri, former president Michel Suleiman, Hezbollah’s parliamentary bloc leader MP Mohammad Raad., FPM leader MP Michel Aoun, PSP leader Walid Jumblatt, former president Amin Gemayel and Army Commander Jean Kahwagi. It is not clear why Bogdanov and Lebanese Forces leader and presidential candidate Samir Geagea did not meet this time even though they met during Bogdanov’s April 2013 visit to Lebanon. Lebanon has been without a president since May 25 when Michel Suleiman ended his tenure without a replacement due to differences between the country’s main rival coalitions. Bogdanov was reportedly in Lebanon to commemorate the 70th anniversary of the establishment of diplomatic ties between Lebanon and Russia at a ceremony that was held at UNESCO Palace in Beirut on Friday but Bogdanov told reporters that Moscow was holding contacts between the Syrian government and the opposition to launch new, unconditional talks to end the crisis in the war-torn country. Russia has been Syria’s main international backer since the conflict erupted in March 2011. A delegation of Syrian dissidents that are tolerated by President Bashar Assad’s regime will travel on Sunday to Russia for meetings with officials, days after government members discussed a new peace process there. The meeting with Russia’s Deputy Foreign Minister Mikhail Bogdanov would include talks “on a political solution, the role of Syria-based opponents and (U.N. envoy) Staffan De Mistura’s initiative,” said delegation member Maher Merhej. The eight-member delegation is expected to return on December 15. Merhej, who heads the Syrian National Youth movement, has been working together with the leaders of three other minor movements since November 2012. Civil society activist Souheir Sarmini is also to travel to Moscow, alongside three MPs, including leading Baath party member Faisal Azzuz, tribal representative Nawaf al-Melhem, and independent politician Hussein Ragheb. 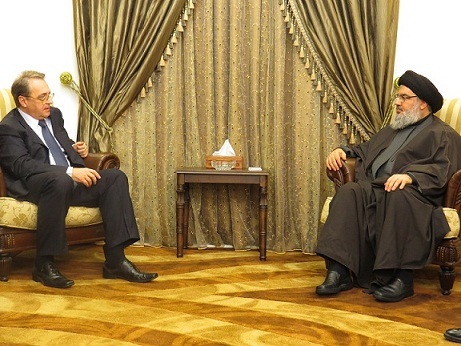 News of their journey came as Bogdanov met in Beirut with Hassan Abdel Azim and two other members of the main regime-tolerated National Coordination Committee for Democratic Change. In November, a delegation of military and political rebels headed by key opposition figure Ahmad Moaz al-Khatib traveled to Moscow. His delegation was followed by a visit by Syrian regime officials, among them Foreign Minister Walid Muallem. No date has yet been announced for the start of a possible new peace process that Moscow is preparing. Syria’s war has killed more than 200,000 people and forced half the population to flee their homes. “That’s a secret.” I wonder what is the secret ? And this Fat boy has his foot on the necks of your leaders starting with ASSir. Enjoy that taste of the Italian leather Wargame. U think he enjoys the taste of gilid? In order to plant wars in full scale at the area America Zionist will invite any countries at the area to involve in it,s dirty war on behalf of Israeli Jews.They will plant their regime at the area to control oil,wealth and ect.Now Protocol of Wise Zionist is going to plant at the are.Divided and rule is an old school to the West ti invade others.It,s turn to worse when Western power is at the hand of Zionist Jews movement.The West being slaves to Zionist bankers.destroying and killing Arabs,planted sectarian as many as they can and urge all sided to fight and kill each others,and Israel will survive.Hence Arabs countries will succumb at their hand with name of democracy.Democracy is nothing to America Zionist.but is a tool to enslaves all Arabs.Take advantage on Arabs tribalism and sectarian to destroy them.Planting democracy in Arabs world is an alibi to America to show its white face to the world and hiding its true black face,to destroy Arab on behalf of Israeli Jews and to enslaves them.America and the west really working on behalf of Zionist bankers,being slaves to Jews to protect Israel and to plant New world order,enslaving all Arabs,even all over the world if they can.